With the SanDisk Sansa Fuze, you can fuse your portable entertainment, featuring 8 GB of storage. Listen, watch, and play all day with 24 hours of battery life and room for up to 1,000 songs**. Watch your favorite video clips on the Sansa Fuze's 1.9-inch color screen. Measuring just 0.3 inches thin, the Sansa Fuze marks the next wave of music and video players. 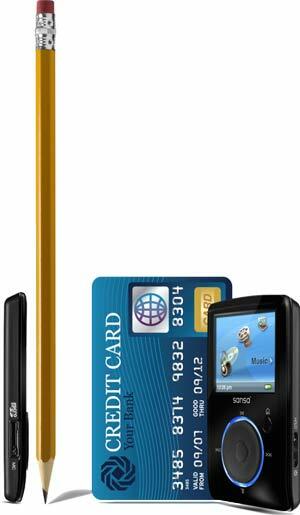 Smaller than a credit card and as thin as a pencil, the new Sansa Fuze MP3 player looks great--and has the brains to match. With room for up to 1,000 songs**, you can listen all day long. Jam to FM radio with 40 preset stations, play with the built-in voice recorder, and listen to your favorite audiobooks wherever you go. And with 24 hours of battery life, you're free to listen, watch, and play all day--literally. The Sansa Fuze comes with 8 GB of built-in memory enough to store 12-hour video playback segments. Watch your favorite video clips from wherever you are. To ensure speedy file transfers, the unit features a USB 2.0 connection. Simply connect the player to a PC, and start dragging files from your Windows Media Player 10 or 11 applications. With an option to extend the capacity, its MicroSD/SDHC memory card slot means storage possibilities are essentially unlimited. Expand your music collection, show albums of photos with up to 2,000 images**, and watch your favorite videos on those long trips. The player supports MPEG4 video files and audio files saved in MP3, secure and unsecured WMA, WAV, Audible, and Overdrive file formats. If you're feeling like a break from your own tunes, or want to dial in the TV frequency at the gym, use the digital FM tuner. Save your favorites on the 40 user presets. Use the voice recorder with built-in microphone to take memos, record meetings or lectures, or capture whatever else you might feel inclined to point a microphone at. When you're ready, transfer your files for listening on your PC. ** Based on continuous audio playback at 128 kpbs MP3; video playback at 512 kbps/ MPEG 4; photos based on 1.7 MB average file size; battery life and performance might vary depending upon usage and settings; battery not replaceable. From the Manufacturer Listen, watch and play all day with up to 24 hours of juice*** and room for hundreds of pix and flix. Smaller than a credit card and as thin as a pencil, this clever little player can put up to 1,000 songs**, 6 two-hour movies***, or 2,000 photos* in your pocket. Plus, unlike other MP3 players, your Sansa Fuze player isn't done when your battery's done. Just re-charge it. And while you're at it, add another memory card whenever you like--and just keep growing your entertainment library. Keep hundreds of tunes or hours of audiobook listening at the ready wherever you go. Or tune into FM radio for news and fresh music anytime. And you've got up to 24 hours for audio playback and 5 hours of video playback with your internal rechargeable battery***. Keep hours of home video or your favorite movies at the ready--and load them onto your Sansa Fuze player quickly thanks to USB 2.0 connection. Just drag and drop files from your Windows Media Player 10 or 11 applications. With the built-in microphone, you can record memos, lectures or all those unexpected, mic-worthy moments throughout your day. When you're ready, transfer the files to your PC for listening and sharing. 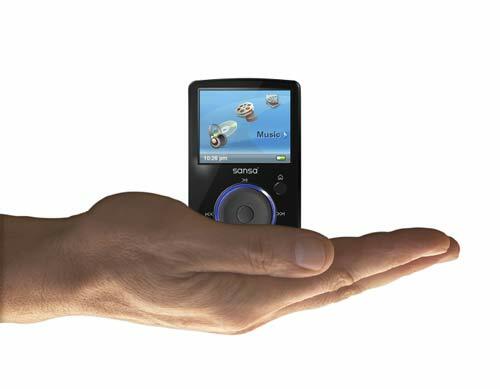 Storage possibilities are essentially unlimited because, unlike other MP3 players, you can swap out the memory card. So get a bigger card or start a memory card library to hold your whole universe of entertainment. The Sansa Fuze player supports MPEG-4 video files and audio files saved in MP3, secure and unsecured WMA, WAV, Audible and Overdrive file formats**. SanDisk Sansa Fuze MP3 player, earphones, USB 2.0 cable. ** Approximation based on 4-minute songs at 128kbps. *** Approximation based on 512kbps video stream. * Based on 2MB average file size. ** Videos (MPEG-4) Music (MP3, WMA, secure WMA and audio book file formats), Photos (JPEG). For additional specifications, please go to sansa.com for more information. *** Based on continuous audio playback at 128kbps MP3; video playback at 512kbps/MPEG4; battery life and performance may vary depending upon usage and settings; battery not replaceable. 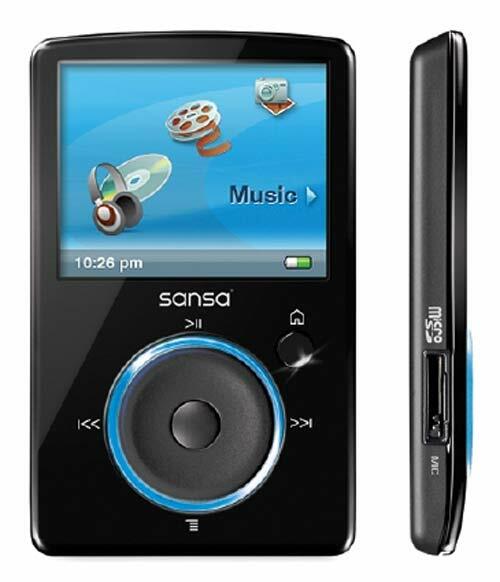 Click the button below to add the SanDisk SDMX14R-004GBA70 Sansa Fuze 8GB Video MP3 Player (Black) to your wish list.